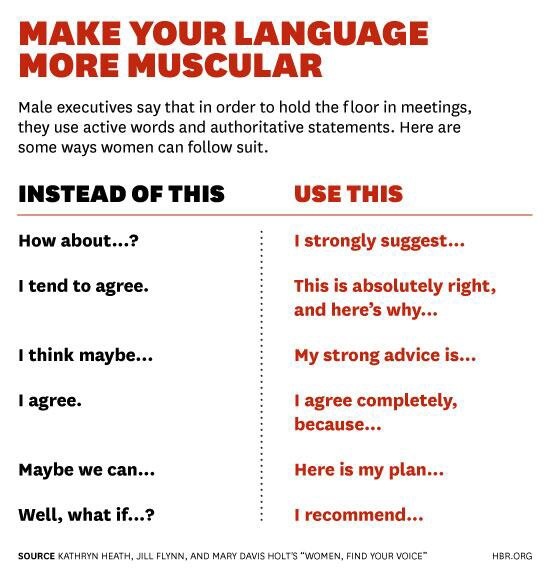 I want to thank the Harvard Business Review for summarizing the issues facing business today so succinctly in one arrogantly sexist graphic. Some pictures may be worth a thousand words, but this one is so, so much more. It’s not that men are the problem, it’s that men think they have all the answers to the problems, and society agrees and — that’s a problem. In Eastern philosophy there is a concept called Yin and Yang. This is often simplified as female (Yin) and male (Yang), but for me that’s too simple an explanation because the truth is that we all possess both energies. Yin is contemplation, nourishment, rest, self-love and consideration for the future. Yang is doing, spending, going, and pushing forward to succeed today. Without Yang, Yin is dormant and unrealized. Without Yin, Yang is out of control and will quickly burn out. They are polar opposites and yet inextricably tied to the success of each other. It takes two to Tango, and it takes Yin and Yang to dance the dance of life. In our Western culture we tend to be very Yang. It encompasses all the things we value in our culture – hard work, achievement, creation, getting s#&t done, making it happen, and so on. We find honor in achievement and subscribe to the saying, “I’ll rest when I’m dead.” As the Dalai Lama so eloquently said about mankind, “he sacrifices his health in order to make money. Then he sacrifices money to recuperate his health… and then dies having never truly lived.” We know this feeling right? Working to enjoy the weekend or a vacation or to secure our future, but when the future comes we are exhausted, sick, and unable to enjoy the fruits of our labor. Right? We are in such a rush that we don’t have time to really listen – just get it done and let’s go. No rest for the weary, know what I mean? And yet we look around and we see the effects of this thinking slowly eating away our world like a colony of termites munching on our home, undetected as we rush around busily doing this and that, feeling very proud of the big mansion we have built on a faulty foundation. Our world is beginning to crumble; expressed through global warming, rampant sickness and disease, war, and that ever-growing empty feeling in the pit of the stomach of humanity. Is this really how we want to run our businesses? In a manner reflective of one of the most profound errors in American history? Do we want the Yin in our business – the planning, the rest, the care, the concern, the openness to alternative views, to become a casualty like the reputation of our country around the world? Let me answer that question on behalf of us all… NO! This is the issue facing business people, men and women, everywhere. A reality that requires us to think beyond the different sexual organs in our pants and find our way to our common heart; that we embrace the Yin and Yang inside each of us, in our beings, in our philosophy and in our boardrooms. 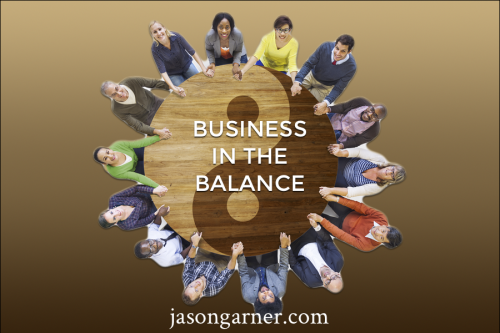 When we replace “either-or” with “and-and both” we create sustainable business, true prosperity and the success that we, the human beings who are the company behind the logos, truly desire. It’s something I wish I had discovered earlier in my life and career. In our Yin nature we care for ourselves, our families, our employees and our co-workers. We foster health, and wellness, and love – yes, love at business. We seek out those in our companies who need a hand and we lend it. We take time to rest. We breathe and stretch and dream. We plan for today and tomorrow. In our Yang nature we take that planning and restful time and we use it to express all the creativity that lives in us. We start new businesses. We realize our plans and dreams. We create new and ever-more innovative products. We live in the moment and we go for it. And in the balance we experience true success. Success from a place of peace and ease — where we listen to all voices, loud and soft, so creativity can be both fostered and expressed. Where we care for ourselves and company profits. Where we look out into the world and take into account the effects of our production and create products and industry where the winning is universal. In the middle path, the road the Buddha traveled, we experience all aspects of ourselves and each other and in the process we find the success we so desire. That road is paved with health, self-love, courage and a diversity of views that when embraced, fill our lives and enterprise with a bold and vibrant nature that fosters success. Today breathe in Yin and express your Yang, and find the peace you desire in the balance. I appreciate the message of your article and agree completely. Unfortunately, my 60+ old boss has told me that I lack leadership ability because I don’t take command in meetings like the Harvard article suggests. And as Bruce Lee often stated, the ability to “be like water” and adapt to your surroundings by working within the established culture seems the only alternative to quitting completely and begin the search for that elusive perfect job. by the way I am a man as well! Thank you for this article. What you say is true and that is we believe we are objects. But back to the point made in your introduction, it is painfully unfortunate that more men won’t expand their thinking to understand that they 1) shouldn’t want women to speak/act like them in the workplace; and 2) we have unique value and skills to bring to the table being ourselves, not their idealized version of how we should be in the workplace. As long as the male dominated culture reinforces sexist and elitist behavior, then it will always be this way. Only the men can stop it…Or maybe Jason Garner’s voice will be heard and one man at a time, he can begin to change sexist attitudes and workplace cultures. First thing I’ve read on the internet that Is actually enlightening honest and interesting in a very long time. Keep putting your messages out there Jason because you’d be surprised how much of a difference one voice can make. I agree…one prime example of this passage…..MY BOSS. He just speaks to women in such a way….I can’t even describe it. What should i do?